The papad quickly bubbles and crisps over the hot stove. A papad is a thin, crisp cracker made with lentil or rice flower. Papad or papadoms are typically served at the beginning of an Indian or Pakistani meal with some type of chutney. These crunchy papadoms are a very satisfying gluten free alternative to crackers that work well in rotation diets because of their minimal ingredients. 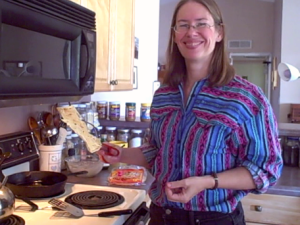 The only ingredients in the brand of papad I use in the video below are lentil flour, water, and caraway seeds. So long as you aren’t reacting to lentil flour or caraway, these should be safe for you to eat. After taste testing the finished papadom. Papadoms are very easy to cook, especially if you buy them ready made at an Indian or Pakistani grocery store. 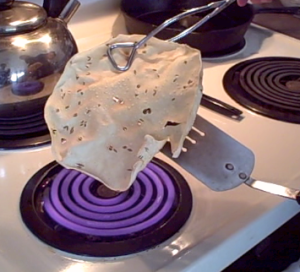 If you only wish to make a few at a time, hold each papad over a hot burner using tongs until it is browned to your liking. If you want to cook more than a few at a time, they can also be laid out on baking sheets in the oven – just be sure to keep an eye on them because they cook very quickly and are easy to burn. The end result is a flavorful, crispy cracker that can be eaten plain or with the condiments of your choice to satisfy that crunchy mouth feel gluten containing crackers normally provide. You are adorable eating your cracker 🙂 Thank you for demo! I love your helpful spirit! what sort of carbs are in the cracker. I am looking for low carb things to take the place of crackers and bread. 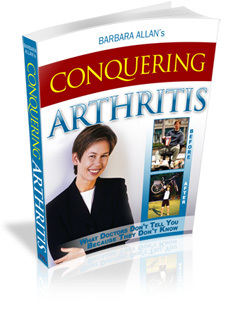 So sorghum is a particularly healthy as grains go, but it is not a low carbohydrate food.